It is possible to create a defensible zone between a brush fire and your home. 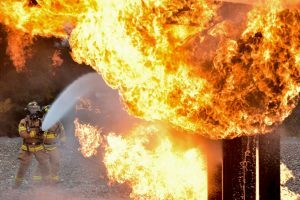 Here are some tips for reducing the risk of fire destroying everything you own. Reduce the Fuel – By keeping the amount of vegetation and materials that surround your home at a minimum, you can reduce the fuel to a fire. Dead vegetation that blankets the forest floor ignites and fuels wildfires. Keep the area around your home clear of leaves, pine needles, and other plant debris. Make sure to clear pine needles or other plant debris out of gutters and your roof, especially during the dry season. Incorporate Firebreaks – Gravel, driveways, canals, and well-irrigated grass strips are great firebreaks. Try to get approximately 30 feet of clear firebreak space around your home to reduce your home’s risk and to ensure emergency vehicles can fight fires from all sides of your home. Use Less-Flammable Materials – Annuals and high-moisture perennials, chunky mulch, rocks, and pavers are great alternatives to vegetation that is full of resins, oils, and waxes that burn easily in a fire. Keep the plants around your home well-watered during the dry season. Prune Trees and Shrubs – To prevent flames from going from the ground to the tree canopies, prune trees so that the lowest limbs are 6-10 feet above the ground and prune shrubs that are below trees so they are 3 feet from the ground. Remove vines and climbing plants that can carry fire from the ground to the treetops. Know which Plants are Flammable – Add to dictionary is one of the most flammable plants in our area. Palmetto, cabbage palms is also highly flammable. 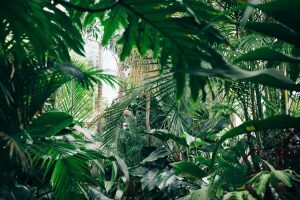 If you don’t remove them, then be sure to clear fallen and dead palm fronds and keep the trunk clear of flammable debris. Get a Quality Safe – A fire can destroy an entire home, but in many cases, a good fire safe is all that is standing after an intense fire. A fire safe is not an item to buy at a big-box store or to buy the cheapest. For true security and peace of mind, invest in a quality fire safe to protect your important documents, jewelry, firearms, and cash. Look for one that is U.L. Rated for fire protection and that has a Palusol Heat Activated door seal. The door seal expands and sticks to the door edge to protect your valuables from damaging heat and smoke. We carry the best fire safe on the market: 131,000 BTU’s and more fireboard than any competitor with a 2.5 hour fire rating at 1200 degrees. It is made in America by Liberty Safe and has a lifetime warranty, so if your safe is damaged in a fire, you will get a new one for free! Stop by our showroom to speak to a fire safe expert. 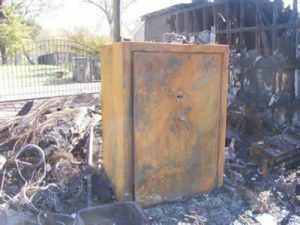 Click to see what happened when John opened his Liberty Fatboy safe after a 3 hour fire destroyed his home. If You Have to Evacuate – First make sure people and pets are safe, then grab any medication, important documents and anything that is easily carried and irreplaceable such as family photos or precious heirlooms. If, and only if, you have plenty of time and you feel safe, you can help firefighters by connecting garden hoses to your outside water valves and clearing your yard of flammable items such as grills. Close all of the windows and interior doors of your home, this can greatly reduce the spread of smoke and flames in your home should it catch on fire. Shove flammable furniture to the center of the room and take down flammable window treatments. If you have gas appliances, turn off the gas and turn off the pilot lights. When You Return Home – Keep a lookout for downed power lines and other hazards. Check your property for smoke, smoldering fires, and hidden embers that could reignite a fire. If you have a safe that survived a fire and needs opening, give us a call.